Charles Lowder, born in Bath, ordained a deacon in 1843 and ordained a priest in 1844. He was the founder of the Society of the Holy Cross. Seeking a parish with a Catholic pattern of worship Lowder became assistant curate at St Barnabas' Church, Pimlico, a church at the heart of an area of slums, built to serve the poor. However, an opponent of high Church worship at St Barnabas' stood for the post of churchwarden in an attempt to bring them to a stop. He hired a man to parade up and down the street wearing a sandwich-board canvassing for votes for churchwarden. Lowder, keen to oppose him, gave money to the choirboys to buy rotten eggs and encouraged them to pelt the board carrier. As a result Lowder was called in front of a magistrate and fined. He was also reprimanded by his bishop and suspended from duty for six weeks. Lowder earned the love of his parishioners and he was known to them as "the Father of Wapping", "the Father" or "Father Lowder". 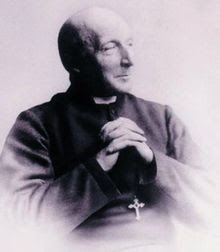 Lowder became the first Church of England priest to receive the title "Father"